There are important trailer hitch accessories you'll need in order to complete your towing equipment package. 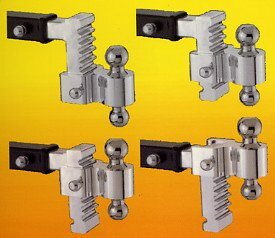 While there are some great trailer hitch accessories you can purchase to make your trailer hitch even more practical like Bike racks, ski and snowboard racks, spare tire carriers, cargo racks, wheelchair racks, motorcycle racks and even BBQ racks, the following trailer hitch accessories are considered essential, "must have" items. We offer a variety of external threaded balls with chrome or zinc finish. Size of trailer coupler socket. Thickness of ball platform or hitch. Utility ball mounts serve as a ball platform for weight carrying receiver style hitches. They can be removed when not in use. We have a selection which drops or raises the height of the ball to allow level towing of your trailer. Extended lengths provide more clearance for turns and tow carry style bike racks. Many are available in chrome, zinc, or black finish. 5 separate drop and raise selections to keep your trailer tongue parallel to the ground. Double ball features reversible 1 - 7/8" and 2" balls or 2" and 2 - 5/16"
Fully tested and verified by an independent lab. Light-weight aluminum construction; only weighs 18 lbs. and is 30% stronger than steel. Fits a 2" standard receiver. 12" full vertical adjustment. 6" adjustment with the rack up or down. Avoid theft by using a locking hitch pin. Hardened and rated for towing. Great for plug in accessories like bike racks and cargo racks. Coupler and fifth wheel locks prevent theft when you're unhitched. Eliminates wobble and rattle in ball mounts. Stabilizes any plug in accessory: bike racks, cargo carriers, motorcycle racks, etc. Unlike some others we've tried, these work! 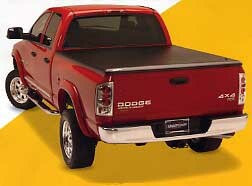 Even for demanding uses, like stabilizing tow carry racks, cargo, and motorcycle carriers. You may want a ball cover to protect not only the ball, but also to protect your clothes from getting dirt and grease all over them. You did know that you must grease the ball up before you tow, right? (Any kind of grease is fine, bearing grease, silicone lube, Vaseline etc.) Hitch caps or plugs protect the hitch from dirt and grime when the ball mount is out and they look good too. They come in plain and fancy styles. 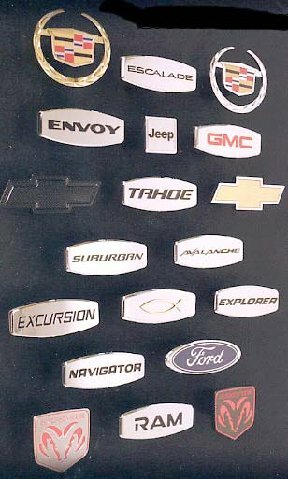 Standard, Novelty, Propeller and Logo Styles, Way Cool Hitch Covers plus Football and Hockey Hitch Covers too. Be sure and purchase a Hitch Lock so no one can steal your cool hitch cover! 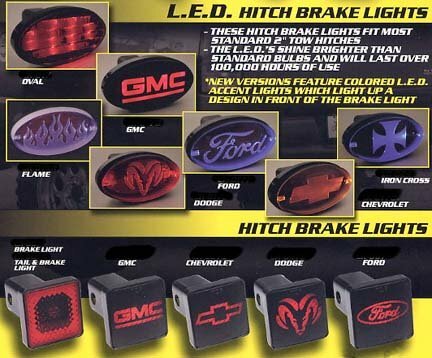 If you are looking for a specific hitch cover that you don't see here, please call and ask if we carry it! 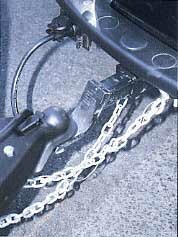 Safety chains are required by law when you tow anything. The reason for them is that if the hitch fails, or if the trailer comes off the ball, the trailer will stay with your vehicle and not go running off all over the road and kill somebody. Your trailer comes equipped with safety chains but you may want to upgrade them to heavier and/or additional chains with case hardened quick connect links. Always have the safety chains attached by crossing them under the tongue and attaching them to the chain brackets on your hitch every single time you tow. They should not restrict sharp turns of the vehicle/trailer, but should be tight enough so they do not drag on the road. So those are the main essential trailer hitch accessories you need to know about. Be sure and read our other articles to learn more about towing safety and towing equipment you may also need for your rig.